This tiny nest looking loaves are one of the prettiest breads I have ever made. These are soft, lightly sweet and a perfect spring treat. 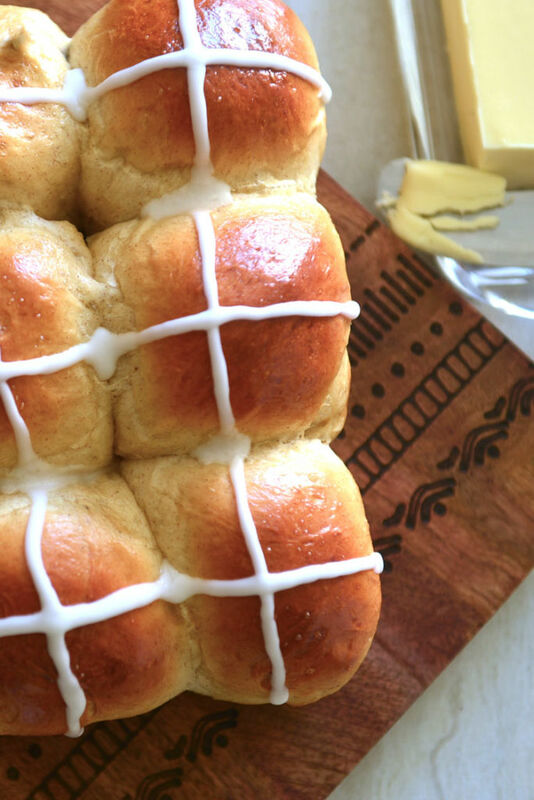 Traditionally Easter breads are rich, as they are celebratory breads marking the end of lent. To me this particular version resembles spring flowers and all the brightness to look forward to after the winter – which incidentally was non existent this year. 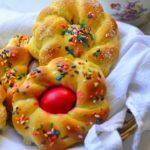 The sprinkles are just so right for the season, but I am partial to the sparkling sugar,and that is what I put on the braids without the eggs – a bit like the powdery snow being brushed away to the sidelines by the peeking pretty spring blooms . I have made a basket of mini wreaths here, but you can make a large wreath as well. These will be pretty impressive centerpiece on the Easter table ! With a little bit of dough woven in the middle to fill the gap and placing the eggs there you could even make this into a large bird’s best. But I was watching the little birds checkout nesting spaces in the yard and these tiny nests seemed perfect. The colored egg in the middle is symbolic. Eggs, while dormant still contains life and cracking it open is symbolic of resurrection. Many places, especially Greece, dye the eggs red – representing Jesus’s blood. The ones, on these Italian breads, on the other hand are dyed in all colors. 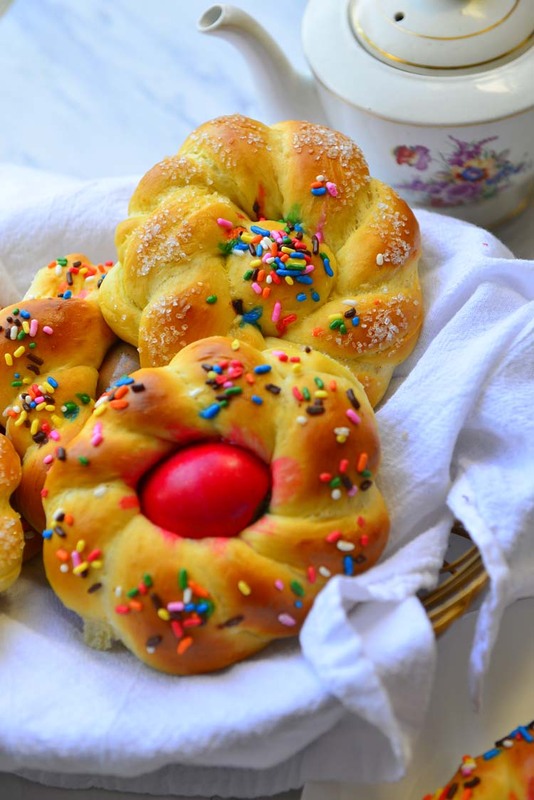 The bread dough is enriched with eggs, sugar and butter. I have cut back a little on the sugar but you can definitely double the amount of sugar used in my recipe. In addition to all these orange zest , anise , spice extracts and dried fruits can also be added. All these additions mean that the dough rises slowly, much slower than the usual bread dough. So if making these plan to spend some extra time. The dough is also a little wet, which is good as it ensures that the braids do not come apart while baking. But for the same reason, I prefer to use the machine for most part of kneading. It can definitely be done by hand, jut be ready for sticky fingers. Even though the machine does most of the heavy lifting, one still has to finish the kneading by hand and of course shape by hand. 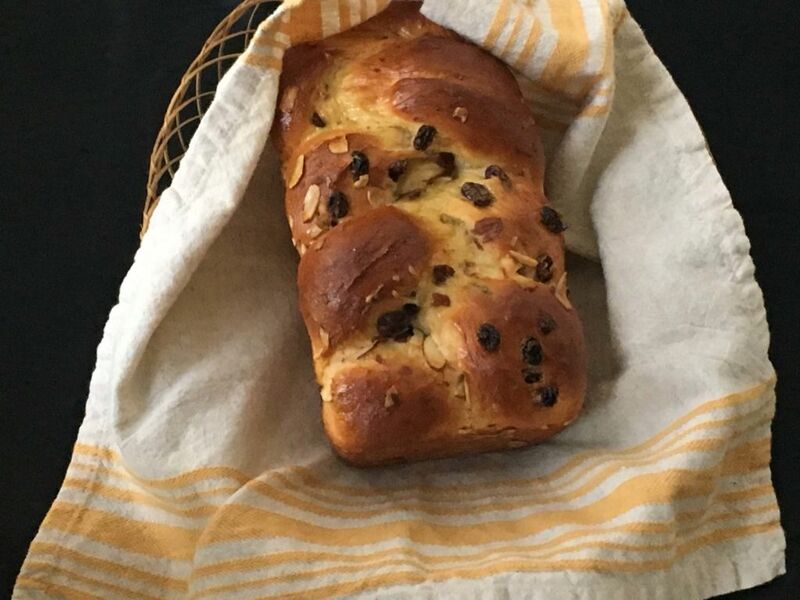 This bread is lightly sweet, if you are looking for a sweeter loaf, double the sugar given in the recipe and once the bread is out of the oven give it a sugar glaze. If glazing after baking add the sprinkles only after glazing. The egg is dyed raw and goes into the oven raw. It gets cooked in the oven perfectly. Use the spoon to crack open the shells :-). Yes, that is why there is a spoon with the bread. I think these rolls spent close to 25 minutes in 350°F oven and the eggs were cooked perfectly – just set and no black ring around the yolks. I am at a disadvantage here. This is not my area of expertise and to be honest I end up making a mess every time. I am surprised that the colors on my fingers did not show up in the video. This is how Id do it – if anyone has a better way I would love to hear about it ! In a small mug or cup large enough to hold the egg, place 1 tsp white vinegar and about 10 drops of food coloring. Pour a little hot water – few tablespoons and mix. Now add the egg, if the water does not cover the egg add more hot water and stir with a tooth pick to ensure that the color is uniform. Let it sit for 5 minutes. Remove from the bowl , wipe with paper towels to. Spray oil on top and store till needed. . Warm the milk to 110°F or just warm to touch. Make sure that the eggs and butter are at room temperature. Take 1 C flour and 1/4 C sugar in the mixing bowl. Stir to combine. Sprinkle the yeast on top and pour about 1/2 of the milk. Mix and set aside for 10 minutes. The mix would have visibly puffed up by then. Add the remaining milk , eggs , butter , salt and 2 1/2 C flour to the bowl . Attach the dough hook and stir to combine for 30 seconds. Increase speed to low and knead for 2 minutes scarping down the sides in between. The dough will be very sticky. After 2 minutes of kneading if the dough is still sticking to the bowl add the remaining flour. Turn the machine back to knead and add the essence and zest. Knead for 2 to 3 minutes. Turn the dough out to a floured work surface and knead by hand for about 1 minute. Form into a smooth ball. Mix flour , salt and butter into a pile on a well floured kneading surface . Make a well in the middle and add the yeast mix . Beat the egg a little and add to the mix. Slowly incorporate the flour into the wet mix in the middle adding as much of the milk as necessary. Once the dough has comes together add the softened butter , essence and zest. Knead for about 10 minutes until the dough feels soft and elastic and visibly shiny. It should no longer stick to the surfaces. If needed add a few more tablespoons of flour. Place the dough in a greased bowl and turn it over once to coat all sides with oil. Cover with plastic wrap (wet towel or a fairly tight lid) and allow the dough to rise in a warm place, about 1 hour and 30 minutes. Gently punch down the risen dough to deflate. Transfer to a floured work surface and pat down to a thick rectangle. Divide into 12 even pieces. Roll each piece to form a rope of about 14 to 16 inches in length. Take two ropes and twist them together. Loop the twist into a circle and interlace the ends and tuck them under. 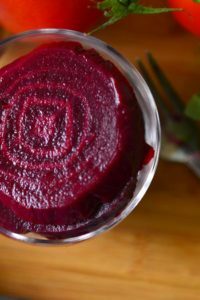 transfer the circle onto a baking sheet lined with parchment paper. If making the filled circles, pinch off a piece from the rope before connecting the ends. Roll the pinched piece into a ball and place in the center. Cover with plastic wrap p and set aside to double in size , about 30 minutes. Place the oven rack in the center. Preheat the oven to 350°F (170°C). Beat 1 egg with 1 tsp of water to make the egg wash. Using a pastry brush brush the tops of the risen loaves. If not using the glaze sprinkle sugar or decorative sprinkles on top. 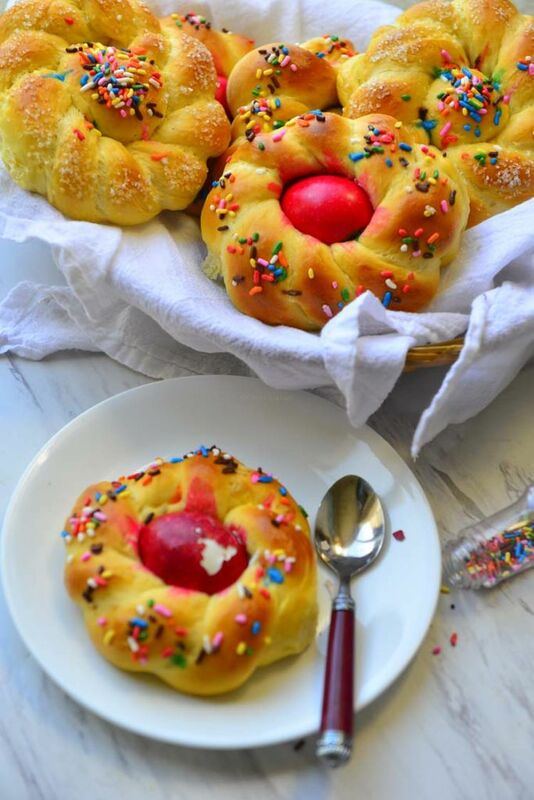 Place the colored raw eggs in the middle of the risen circles. Use flour with good protein content. You could let the dough rise slowly in the fridge (first rise/bulk proof) overnight. Double the sugar for a sweeter version. In this case the dough will need longer than 90 minutes to double in size. You can easily double or triple the recipe. 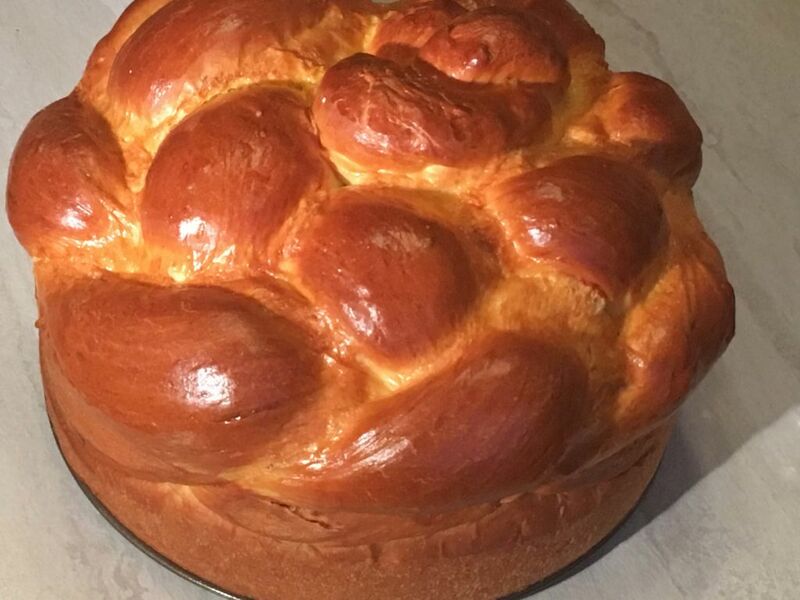 When making the quick sponge make sure that you mix the flour and sugar together before adding yeast. If doubling sugar, add the extra sugar along with the extracts. Oh my they sound really superb, I reckon no egg for me, but hey both look stunning! Wow , that is so neat ! I see the significance of red. 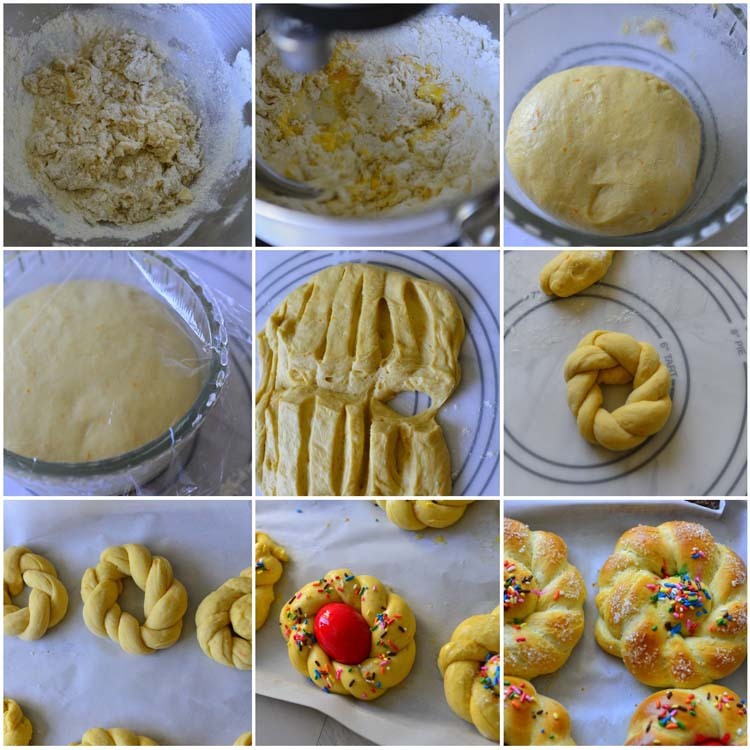 This is such a fun bake , for us and the kids!